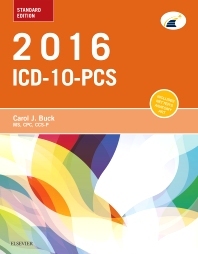 Select and build procedure codes accurately with Carol J. Buck's 2016 ICD-10-PCS: Standard Edition. Designed by coders for coders, this practical manual includes all the ICD-10-PCS codes needed for today’s inpatient procedure coding. As coders need more extensive knowledge to work with ICD-10-PCS — and to choose from the thousands of possible codes — this edition provides an essential background in A&P, pathology, and medical terminology, along with colorful Netter’s Anatomy illustrations and tables organized to help you choose and build procedure codes. Together, these features make procedure coding faster and easier. Also included is a companion website with the latest coding news and updates! Two-color design provides an economical version of this ICD-10-PCS coding manual.